James Spriggs Payne (December 19, 1819 – January 31, 1882) served as the fourth and eighth President of Liberia, from 1868 to 1870 and from 1876 to 1878. He was the last President to belong to Liberia's Republican Party. Payne was born in Richmond, Virginia, in 1819 to former slaves who were each of mixed race, of European and African ancestry. Payne grew up in a highly religious Methodist family and was a devout Christian. His father, David M. Payne, was a Methodist minister and was ordained as a deacon by the Virginia Conference in 1824. Payne was very fair; he was said to be of seven-eighths European-American ancestry, or one-eighth African. When Payne was ten years old, his family emigrated to Liberia through sponsorship by the American Colonization Society on the ship Harriet. On the same ship was Joseph Jenkins Roberts, Liberia's future first president. Aside from religion, the young Payne showed interest in politics and economics. He later became a successful writer in these areas. As an adult, he was appointed by the Liberian government to work to complete the severance of Liberia's ties to the American Colonization Society. Payne was elected as the fourth president in 1868 and served a two-year term. During his presidency, he worked to end the slave trade that still took place along Liberia's coast. (Other reports though (History of Liberia and Joseph Jenkins Roberts) say: “The slave trade from Liberian ports was ended by the British Navy in the 1850s.”) He improved government relations with the native communities and peoples, whom he believed the newer settlers and politicians had for the most part ignored. He worked to extend Liberia's trading and political ties with Europe. Payne was elected a second time in 1876 and served until 1878. Escalating economic difficulties began to weaken the state's dominance over the coastal indigenous population. When the financially burdened ACS withdrew its support from the colony in the years after the American Civil War, conditions worsened as Liberia struggled to modernize its largely agricultural economy. The cost of imported goods was far greater than the income generated by the nation's exports of coffee, rice, palm oil, sugarcane, and timber. Payne increased the country's foreign trade. On leaving political office in 1878, Payne continued his lifelong involvement in church work. In 1880, he was the Liberian delegate at the General Conference of the Methodist Episcopal Church in Cincinnati, Ohio, USA. The next year, he was elected president of the Methodist Annual Conference of Liberia. 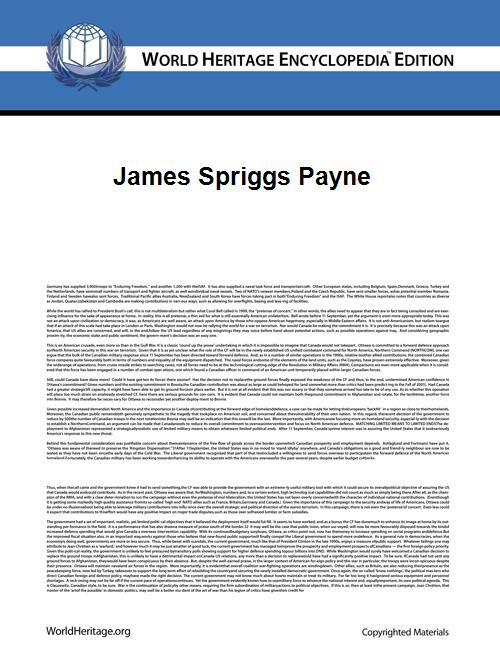 James Spriggs Payne died in Monrovia in 1882. In January 1882, he was awarded an honorary doctor of divinity degree by Liberia College (now University of Liberia) for his life achievements. Spriggs Payne Airport in the Monrovia area is named after him. 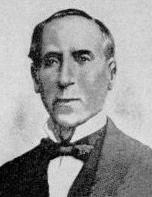 Besides Payne's descendants in Liberia, the Krio branch of the Blyden family are descended from Payne through his granddaughter Anna Erskine, who was the partner of Edward Wilmot Blyden. ^ Liberia: America's Footprint in Africa: Making the Cultural, Social, and Political ConnectionsJesse N. Mongrue, , iUniverse.com, 2013, p. 72. ^ Melton (2007), p. 58. ^ "Roll Of Emigrants That Have Been Sent To The Colony Of Liberia, Western Africa, By The American Colonization Society And Its Auxiliaries, To September 1843"